Very soluble in water, freely soluble in alcohol. Stable, but slowly darkens upon exposure to light. Incompatible with strong oxidizing agents. Diphenhydramine hydrochloride is an antihistamine drug having the chemical name 2-(Diphenylmethoxy)- N,N-dimethylethylamine hydrochloride. It occurs as a white, crystalline powder, is freely soluble in water and alcohol and has a molecular weight of 291.82. Diphenhydramine hydrochloride in the parenteral form is a sterile, pyrogen-free solution available in a concentration of 50 mg of diphenhydramine hydrochloride per mL. The solutions for parenteral use have been adjusted to a pH between 5.0 and 6.0 with either sodium hydroxide or hydrochloric acid and contains 0.1 mg/mL benzethonium chloride as a germicidal agent. Use in Neonates or Premature Infants: This drug should not be used in neonates or premature infants. Use in Nursing Mothers: Because of the higher risk of antihistamines for infants generally, and for neonates and prematures in particular, antihistamine therapy is contraindicated in nursing mothers. Use as a Local Anesthetic: Because of the risk of local necrosis, this drug should not be used as a local anesthetic. Antihistamines are also contraindicated in the following conditions: Hyper sensitivity to diphenhydramine hydrochloride and other antihistamines of similar chemical structure. Diphenhydramine is a H1-histamine receptor antagonist. 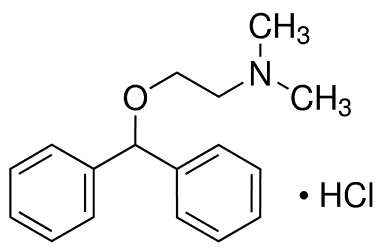 Diphenhydramine is categorized as an antihistaminic; sedative, hypnotic. ChEBI: The hydrochloride salt of diphenhydramine. Diphenhydramine hydrochloride, 2-(diphenylmethoxy)- N,N-dimethylethanamine hydrochloride (Benadryl), is an oily, lipid-soluble free base available as the bitter-tasting hydrochloride salt, which is a stable, white crystalline powder soluble in water (1:1), alcohol (1:2) and chloroform (1:2). The salt has a pKa value of 9, and a 1% aqueous solution has a pH of about 5. In addition to antihistaminic action, diphenhydramine exhibits antidyskinetic, antiemetic, antitussive and antimuscarinic, and sedative properties.As an antihistaminic agent, diphenhydramine is recommended in various allergic conditions and, to a lesser as an antitussive and Parkinsonism drug. It is also used in OTC sleep-aid products. It is administered either orally or parenterally in the treatment of urticaria, seasonal rhinitis (hay fever), and some dermatoses. White or almost-white crystalline powder. Odorless with a bitter numbing taste. pH (5% aqueous solution) 4-6. Water soluble. Aqueous solutions are acidic. N-(2-Diphenylmethoxyethyl)-N,N-dimethylamine hydrochloride gives acidic solutions in water. Neutralizes bases. May react with strong oxidizing and strong reducing agents. May catalyze organic reactions. Slowly darkens on exposure to light. Flash point data for N-(2-Diphenylmethoxyethyl)-N,N-dimethylamine hydrochloride are not available; however, N-(2-Diphenylmethoxyethyl)-N,N-dimethylamine hydrochloride is probably combustible. H 1 receptor antagonist. Antihistamine. This antihistaminic drug with sedative properties is mainly sold over the counter. It can be used both topically (treatment of pruritis) and orally for its antiallergic, antiemetic, sedative, and anticough properties. Allergic or photoallergic contact dermatitis and fixeddrug eruption seem to be rare. Poison by ingestion, subcutaneous, intravenous, and intraperitoneal routes. Human systemic effects by ingestion or skin contact: arrhythmias, ataxia, blood pressure elevation, convulsions, distorted perceptions, eye effects, and hallucinations. Experimental teratogenic and reproductive effects. Questionable carcinogen with experimental tumorigenic data. When heated to decomposition it emits very toxic fumes of NO, and HCl. See also ESTERS and ETHERS. 147-24-0 US $500.00 / KG 1KG 99% 100000KG Hubei XinRunde Chemical Co., Ltd.